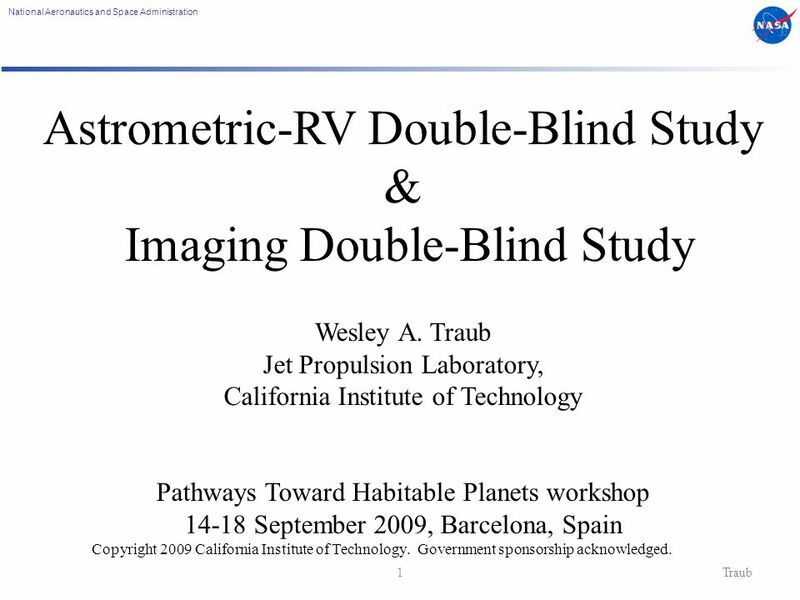 1 National Aeronautics and Space Administration 1Traub Astrometric-RV Double-Blind Study & Imaging Double-Blind Study Wesley A. Traub Jet Propulsion Laboratory, California Institute of Technology Pathways Toward Habitable Planets workshop 14-18 September 2009, Barcelona, Spain Copyright 2009 California Institute of Technology. Government sponsorship acknowledged. 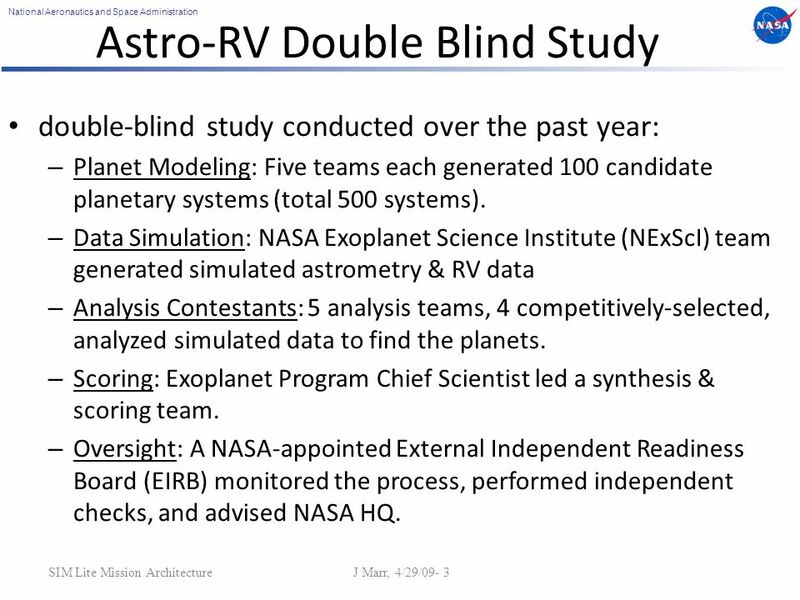 3 National Aeronautics and Space Administration SIM Lite Mission Architecture J Marr, 4/29/09- 3 Astro-RV Double Blind Study double-blind study conducted over the past year: – Planet Modeling: Five teams each generated 100 candidate planetary systems (total 500 systems). 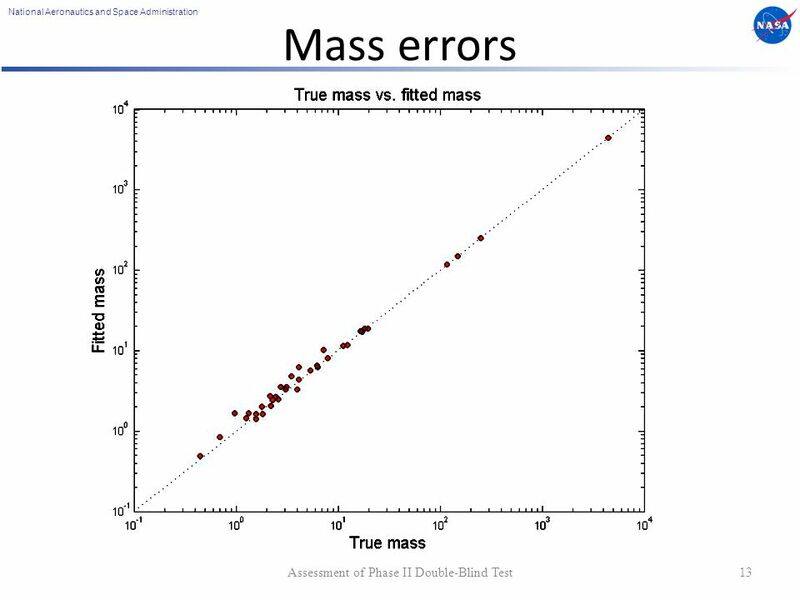 – Data Simulation: NASA Exoplanet Science Institute (NExScI) team generated simulated astrometry & RV data – Analysis Contestants: 5 analysis teams, 4 competitively-selected, analyzed simulated data to find the planets. 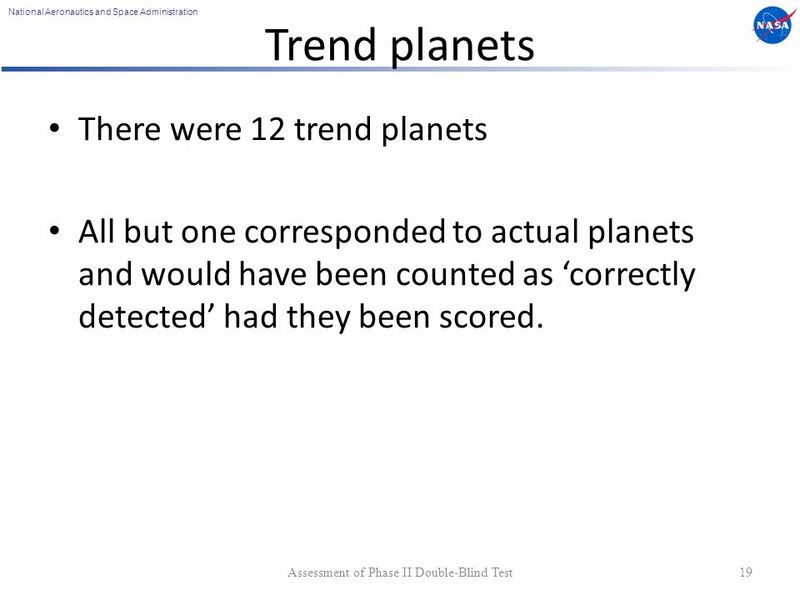 – Scoring: Exoplanet Program Chief Scientist led a synthesis & scoring team. – Oversight: A NASA-appointed External Independent Readiness Board (EIRB) monitored the process, performed independent checks, and advised NASA HQ. 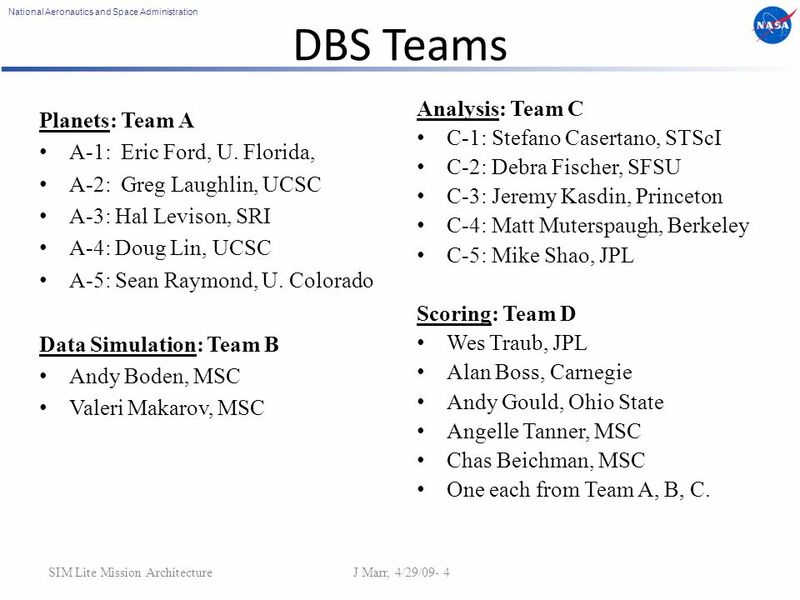 4 National Aeronautics and Space Administration SIM Lite Mission Architecture J Marr, 4/29/09- 4 DBS Teams Planets: Team A A-1: Eric Ford, U. Florida, A-2: Greg Laughlin, UCSC A-3: Hal Levison, SRI A-4: Doug Lin, UCSC A-5: Sean Raymond, U. Colorado Data Simulation: Team B Andy Boden, MSC Valeri Makarov, MSC Analysis: Team C C-1: Stefano Casertano, STScI C-2: Debra Fischer, SFSU C-3: Jeremy Kasdin, Princeton C-4: Matt Muterspaugh, Berkeley C-5: Mike Shao, JPL Scoring: Team D Wes Traub, JPL Alan Boss, Carnegie Andy Gould, Ohio State Angelle Tanner, MSC Chas Beichman, MSC One each from Team A, B, C.
5 National Aeronautics and Space Administration SIM Lite Mission Architecture J Marr, 4/29/09- 5 DBS Planetary-Systems Two phases: – Phase-1: 48 planetary systems, all 1-Sun @ 10 pc 32 from Modeled systems; 8 Solar-system-analogs; 4 single terrestrial in HZ; 4 no-planets, Analysis teams competed with each other. 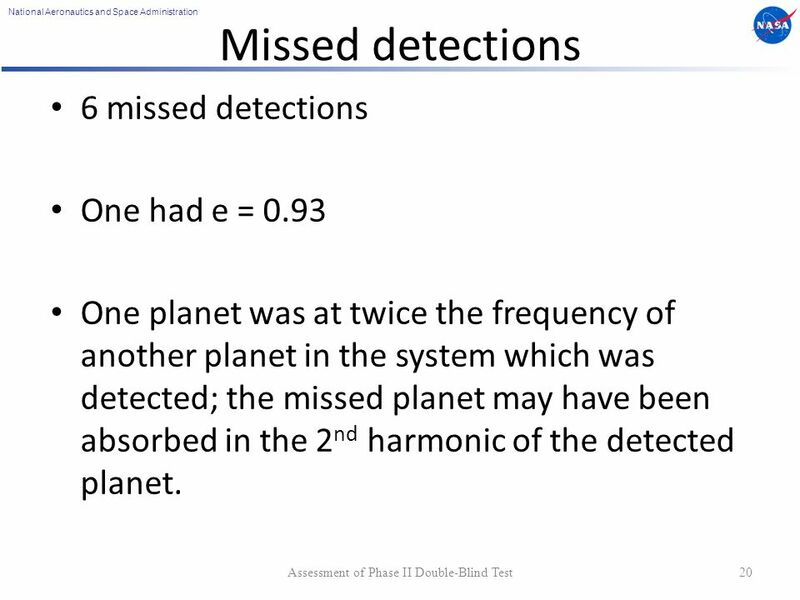 – Phase-2: 60 planetary systems around candidate nearby FGK target stars (real potential target stars). All 60 scaled for stellar luminosity. 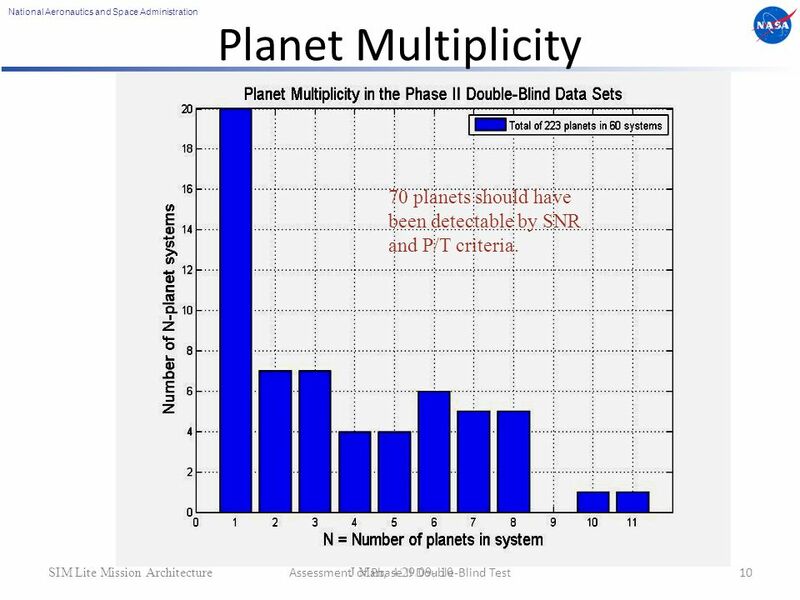 Systems contained 1 to 11 planets. Analysis teams jointly selected each best solution. 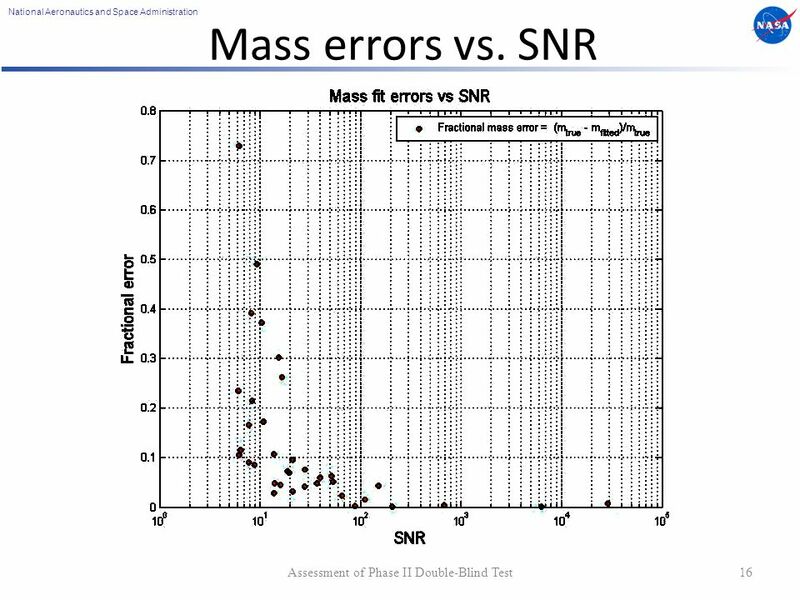 6 National Aeronautics and Space Administration DBS Phase 2 EIRB Briefing (Rev1) Marr, et al, 4/13/09- 6 Expected error bars – Expected variance (Cramer-Rao minimum variance bound) for each parameter calculated, using Fischer information matrix. 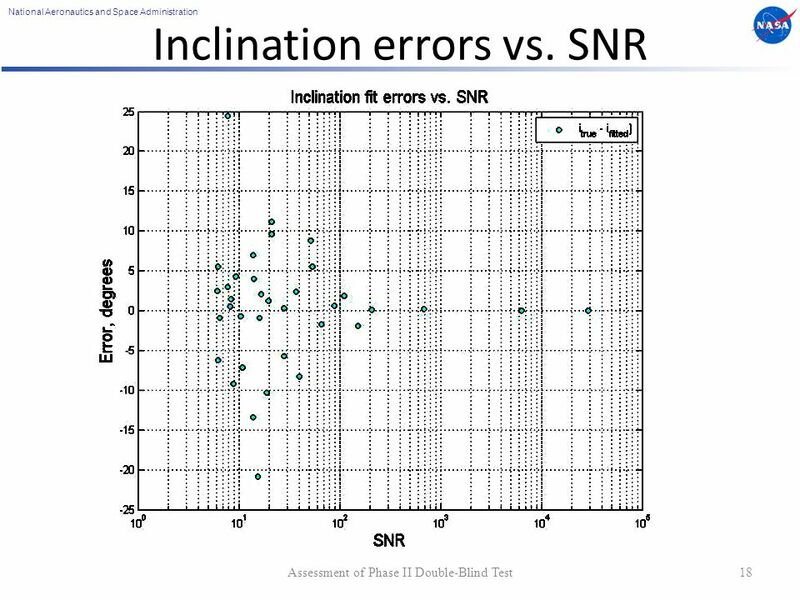 – All correlations between parameters automatically included in each error bar. – Astro and RV data all included together. – Ref: Andy Gould, Astroph. 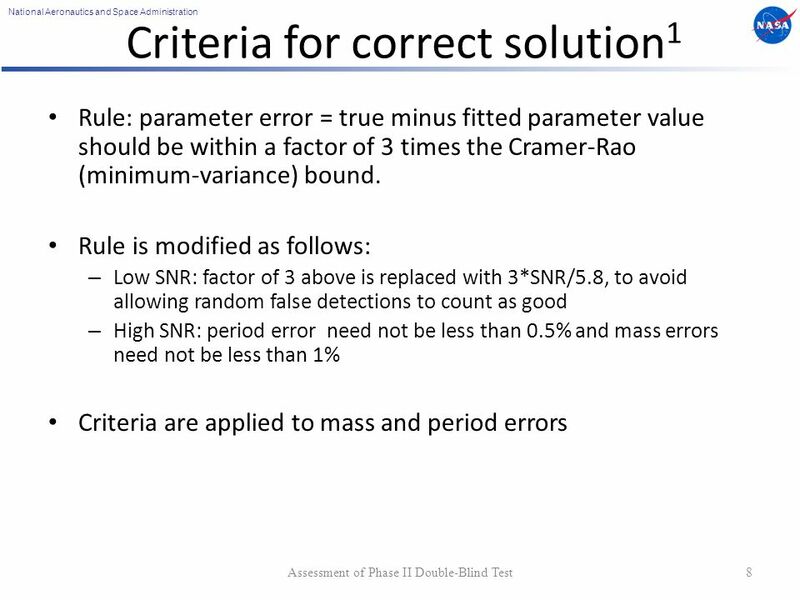 7 National Aeronautics and Space Administration DBS Phase 2 EIRB Briefing (Rev1) Marr, et al, 4/13/09- 7 Planet Detection Criteria Before answers revealed: – Each Team C used their own criteria to generate their own solutions. Targeted < 1% FAP. – Team Cs used a judgment based approach to combine their results in to a single recommendation. 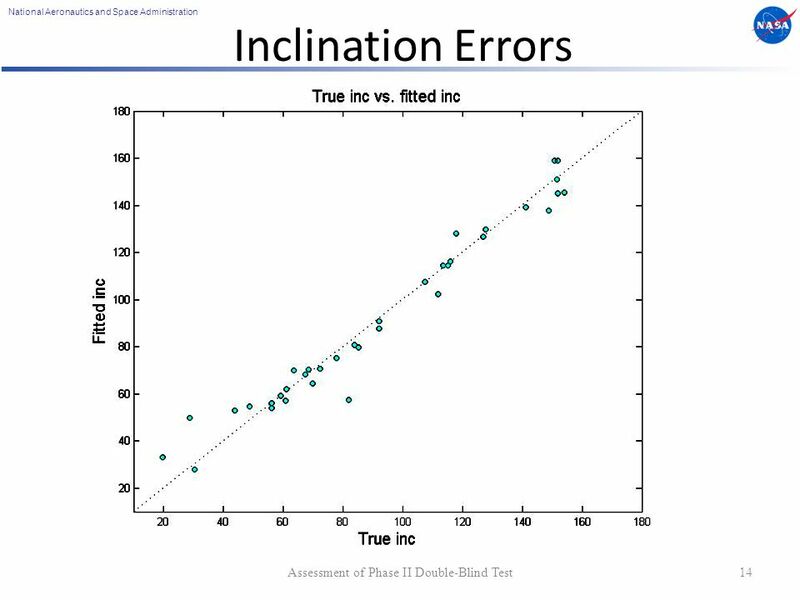 After answers revealed: – See next chart. 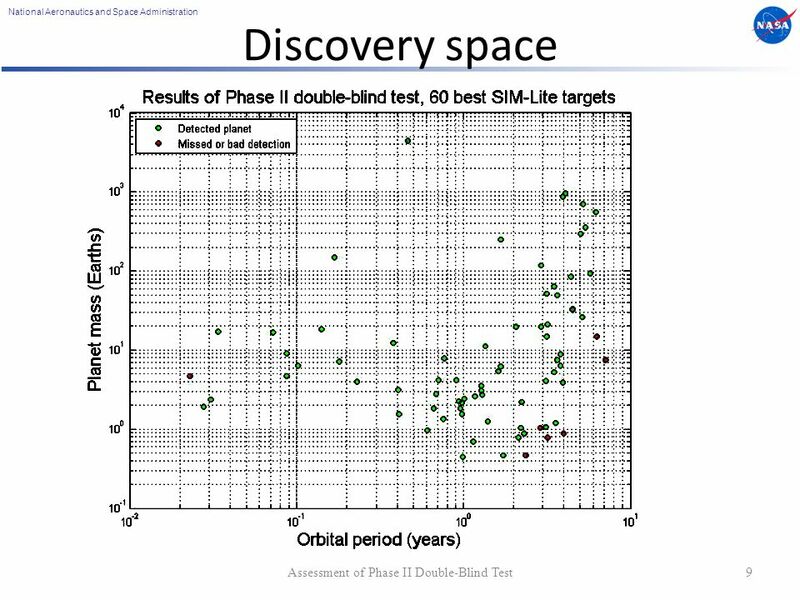 10 National Aeronautics and Space Administration SIM Lite Mission Architecture J Marr, 4/29/09- 10 Planet Multiplicity Assessment of Phase II Double-Blind Test10 70 planets should have been detectable by SNR and P/T criteria. 11 National Aeronautics and Space Administration SIM Lite Mission Architecture J Marr, 4/29/09- 11 50% completeness at SNR ~ 5.8, by theory as well as experiment. 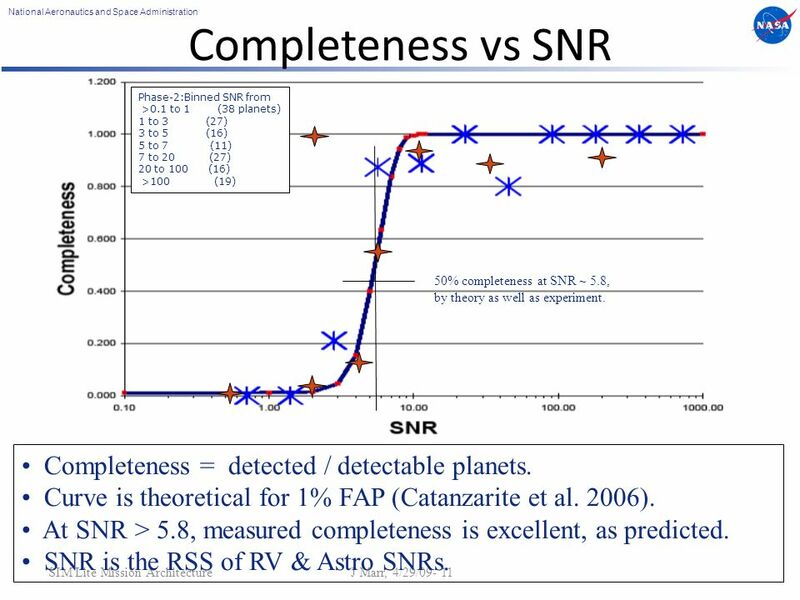 Phase-2:Binned SNR from >0.1 to 1 (38 planets) 1 to 3 (27) 3 to 5 (16) 5 to 7 (11) 7 to 20 (27) 20 to 100 (16) >100 (19) Completeness vs SNR Completeness = detected / detectable planets. Curve is theoretical for 1% FAP (Catanzarite et al. 2006). 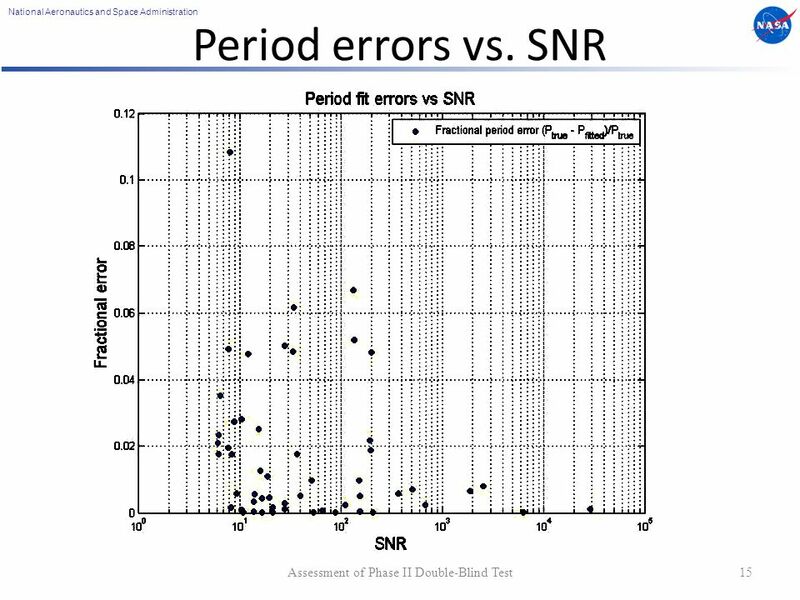 At SNR > 5.8, measured completeness is excellent, as predicted. SNR is the RSS of RV & Astro SNRs. 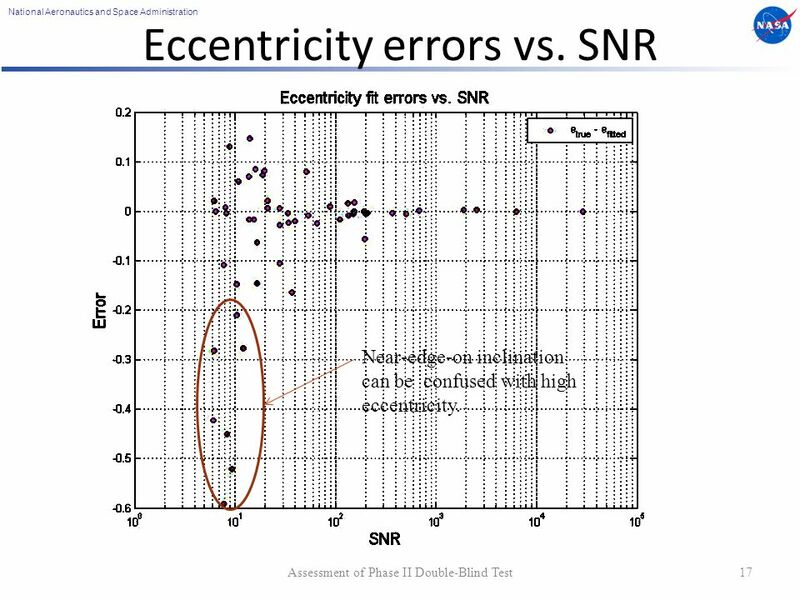 17 National Aeronautics and Space Administration Eccentricity errors vs. SNR Assessment of Phase II Double-Blind Test17 Outliers generally have near–zero eccentricity. Near-edge-on inclination can be confused with high eccentricity. 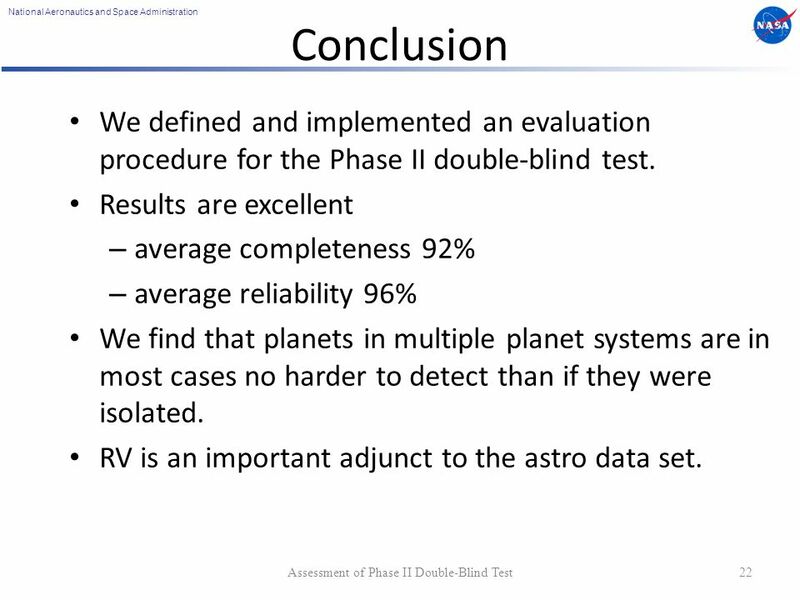 22 National Aeronautics and Space Administration Assessment of Phase II Double-Blind Test22 Conclusion We defined and implemented an evaluation procedure for the Phase II double-blind test. 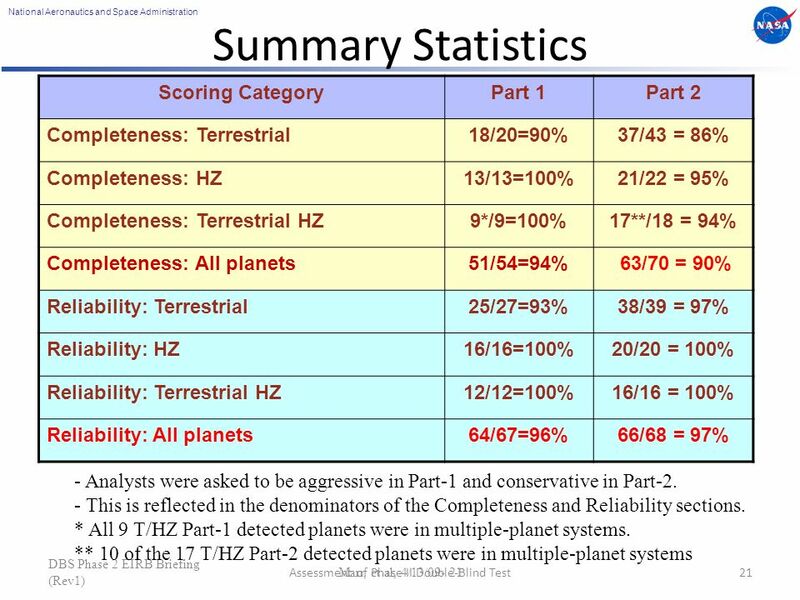 Results are excellent – average completeness 92% – average reliability 96% We find that planets in multiple planet systems are in most cases no harder to detect than if they were isolated. 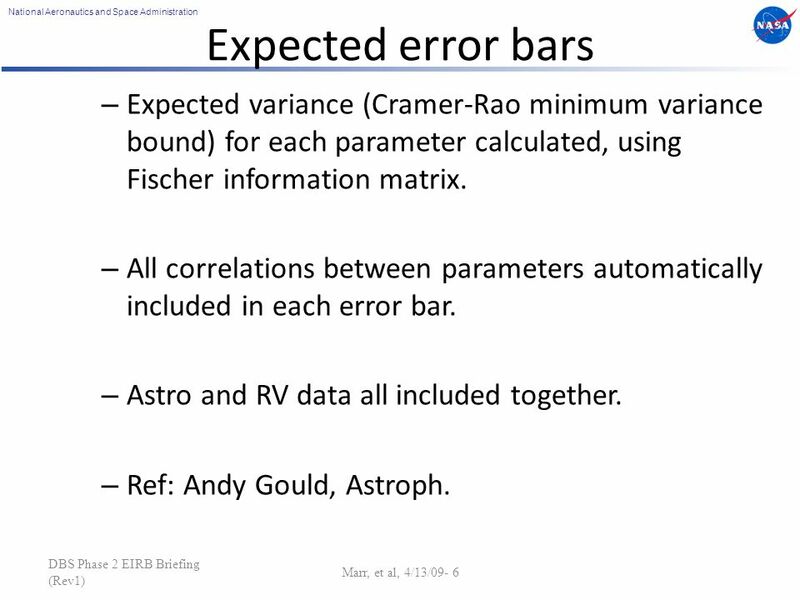 RV is an important adjunct to the astro data set. 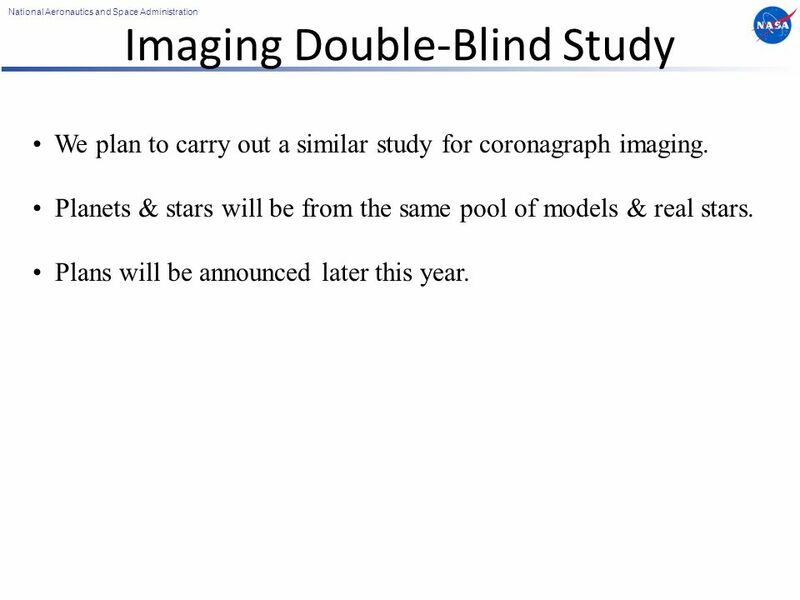 23 National Aeronautics and Space Administration Imaging Double-Blind Study We plan to carry out a similar study for coronagraph imaging. 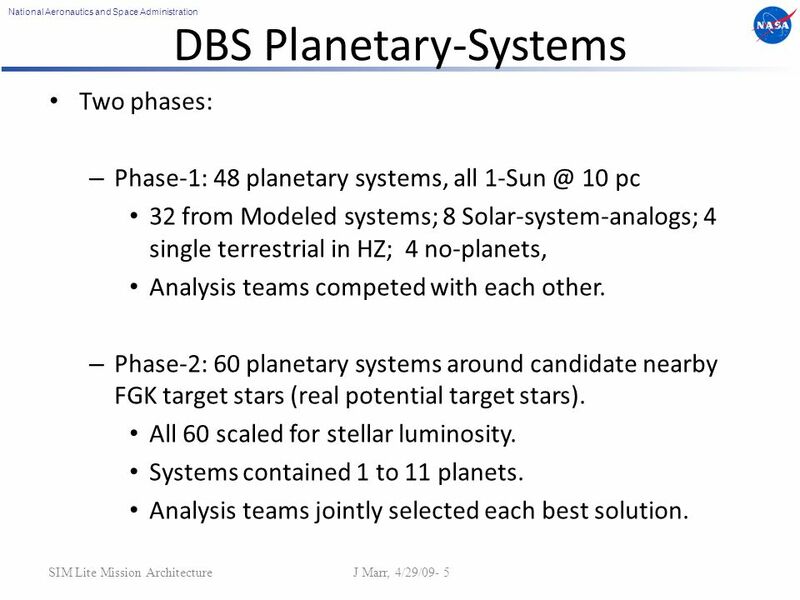 Planets & stars will be from the same pool of models & real stars. Plans will be announced later this year. 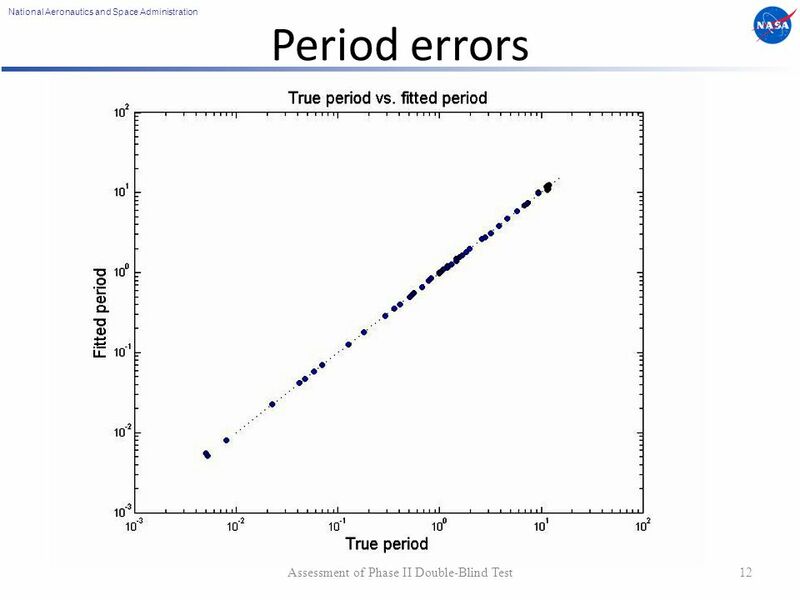 Download ppt "National Aeronautics and Space Administration 1Traub Astrometric-RV Double-Blind Study & Imaging Double-Blind Study Wesley A. Traub Jet Propulsion Laboratory,"
National Aeronautics and Space Administration Jet Propulsion Laboratory California Institute of Technology M. Shao Jan SIM-Lite Update M. Shao. 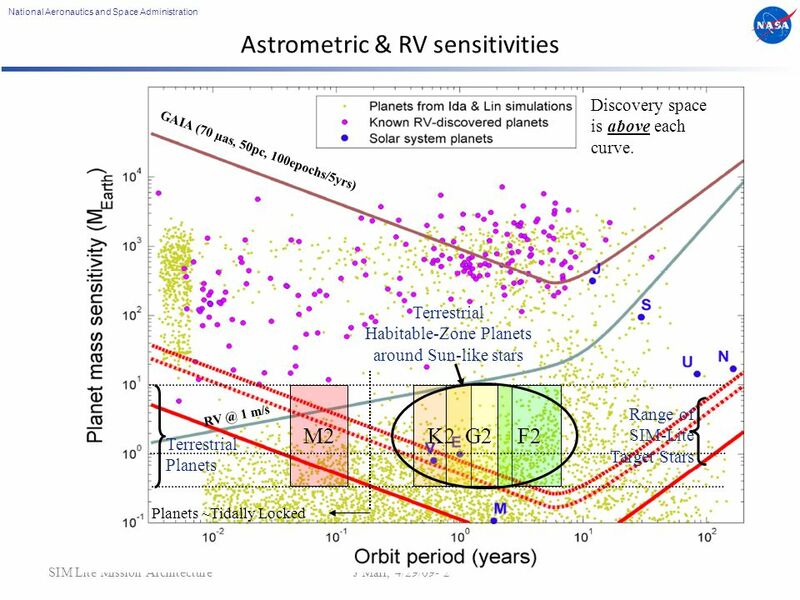 Satellite meeting - Designating habitable planets for follow-up study: what are the relative parameter spaces of RV and astrometry? (P2 Panel) Scientific. AYP Changes for 2007 K-20 Videoconference June 11, 2007 Presented by: JoLynn Berge OSPI Federal Policy Coordinator. EuroCondens SGB 125- 300 E.